In the Fall of 2003 I was very fortunate enough to obtain a nice group of Chondros from my very good friend Eugene Bessette of Ophiological Services ( OS ). This group represents some of his top progeny from 1998. In that transaction I acquired EB98-92Vi " Golden Mayan Serpent " and her brother EB98-76Vi. 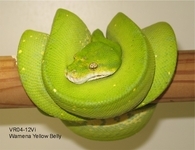 Both of these High Yellow creatures came from Eugene's top High Yellow producing Sire EB88-01vi and Dam EB93-51vi Along with them I received a second outstanding female EB98-20Vi " Harvest Gold ". Her pedigree goes back to the very first Chondros Eugene Produced in the late seventies. 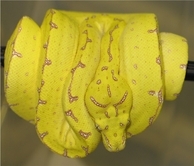 Her Sire EB86-11vi and Dam EB93-43vi have also produced some outstanding Yellow & Blue chondros. 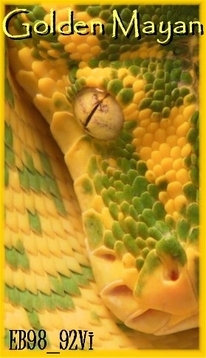 Recently - I also aquired a stud male "Aztec Sun" EB98-01vi another very High Yellow Chondro from Eugenes top yellow producing bloodlines. 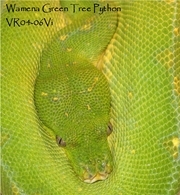 EB98-01Vi is one of OS's cornerstone offspring of over 30 years of breeding & his sire is a Dr. Van Mierop's VM83-BVi. Along with EB98-01 I aquired his daughter EB04-55vi. 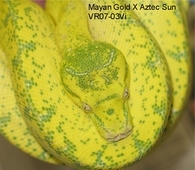 This female rivals the looks of Golden Mayan & I plan on breeding her to a beautifull high yellow Biak in 2013. The " Star Dust " Wamenas derived from chondros found High in the mountains of Irian Jaya. Most Founder animals came from Karubaga which is close to the town of Wamena situated in the Baliem Valley. These Highland chondros share their environment with the elusive Boelens Pythons and it gets quite cool at night ( As low as 55 F ). They do not like being kept too warm. They prefer a cool night temp too. All of my Adults are well aclimated animals that I purchased as hatchlings from The Bushmaster himself - Kamuran. A few of them are " Star Dust " phase. Some people call this phase - " Mite Phase ". But I feel it has a negative connotation to it and renamed mine - " Star Dust ". I proved this trait to be genetic as I have produced a Star Dust from breeding a Star Dust Wamena to normal appearing Wamena chondro. 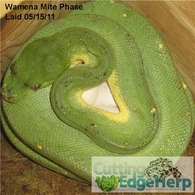 I still do not know if it is recessive or dominant trait and more breeding will need to be done before I figure it out.